Lord's Seat is the highest of the fells north of Whinlatter Pass, and is at the centre of the Thornthwaite Fells, but it is a rather shy fell, hidden from view in most of the surrounding valleys by its own outlying spurs. It is particularly well hidden from the east, where the steeper lower slopes and the eastern spur that ends at Barf appear to form the skyline. The fell only really comes into sight from the quiet Wythop Valley, or from the valley of Aiken Beck and its tributaries, which sit below its western slopes but are rarely visited. Lord's Seat is a particularly neat fell, with four ridges that run north-east to Barf, north-west to Broom Fell, south-west to Aiken and south-east to Ullister Hill and beyond that to Seat How. However none of the subsidiary summits are much lower than the main top, so Lord's Seat doesn't really stand out quite as much as its position and form would lead you to expect - it almost comes across as a squashed version of Grisedale Pike, where the summit is lifted rather more above its ridges. For me the best route up Lord's Seat is via Barf - the other routes tend to spend too much time in the forest, and the views of Bassenthwaite Lake from Barf are well worth the diversion. In most directions the slopes of Lord's Seat are gentle enough to allow easy access. Only to the east is there a line of crags that require special care, and here there is one gap - the path that runs up from the old Swan Hotel alongside Beckstones Gill then turns back to reach the top of Barf, from where a clear path continues on to Lord's Seat. From the south the routes come through Whinlatter Forest - a study of the map shows that there are many possible routes to take, eventually leading to a path that runs around the back of Ullister Hill. A side branch comes off this path and heads up to Lord's Seat (we use this in reverse on our walk). From the west the top can be reached up the valley of Aiken Beck, either following the forest track along Aiken Beck and up to Ullister Hill or the footpath up the unnamed western beck. The northern slopes are also fairly easy, but lack clear footpaths. 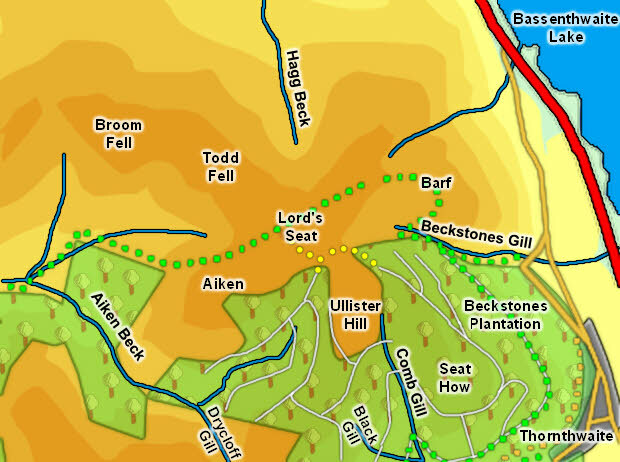 We have an ascent of Lord's Seat via Barf, returning partly through the woods on Ullister Hill. The summit is a gentle grassy dome with a scattering of rocks in the slopes just below. The Forest Fence runs just south of the summit, so the views are uninterrupted by wire. Four ridges run away from the summit of Lord's Seat, heading north-east to Barf, north-west to Broom Fell, south-west to Aiken and south-east to Ullister Hill. A beck rises in each of these valleys - Hagg Beck flowing north, Beckstones Gill flowing east, Auken Beck rising in the south (but then curving around Aiken until it ends up flowing west away from Lord's Seat) and an unnamed beck that flows west and joins Aiken Beck. Lord's Seat has no tarns. Whinlatter Forest almost reaches the top of Lord's Seat, but falls short just to the south. The area inside the forest fence is thus crossed with footpaths, bike routes and above the main tree line is a delightful mix of heather, rock and scattered smaller trees.